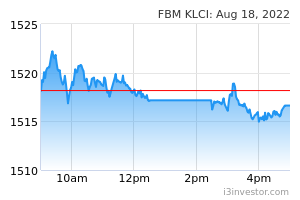 KUALA LUMPUR: The FTSE Bursa Malaysia KLCI (FBM KLCI) rebounded into positive territory in early trade today, led by Tenaga Nasional, which rose 1.7 per cent to RM12.26 after losing four per cent at yesterday's close. The index, which opened 0.3 of-a-point higher at 1,624.53, improved to 1,625.40 at 9.15 am. On the broader market, gainers outnumbered decliners 172 to 105, while 212 counters remained unchanged, 1,390 untraded and 32 others suspended. Turnover stood at 215 million shares worth RM96.1 million. Malacca Securities Sdn Bhd said after Bursa Malaysia stocks took a steeper tumble yesterday, sentiments are becoming increasingly frail that is likely to leave market interest on the wayside. It said there are few leads and this resulted in fewer buying opportunities for market players. At the same time, the uncertain market outlook is also causing many investors to close out positions. "It said despite the still largely frail market conditions, we do not discount the possibility of a quick rebound to end the week after yesterday’s steep falls. "Much of the rebound will be on mild bargain hunting activities, but we also think that the gains will be measured with the wariness still very much a feature of the current market environment," it added. Of the heavyweights, Maxis went down 10 sen to RM5.60 while Digi dropped five sen to RM4.65 sen. Meanwhile, CIMB rose one sen to RM5.07, Maybank and Public Bank were flat at RM9.26 and RM22.62, while PetChem dropped 16 sen to RM8.80 and IHH Healthcare was one sen lower at RM5.54. Of the actives, Bio Osmo was unchanged at 7.5 sen, Bina Puri added two sen to 20.5 sen and Iskandar Waterfront increased 4.5 sen to RM1. The FBM Emas Index improved 14.27 points to 11,547.67, the FBMT 100 Index gained 15.89 points to 11,374.01 and the FBM Ace Index inched up 25.23 points to 4,739.24. The FBM Emas Shariah Index advanced 10.85 points to 11,738.16 and the FBM 70 appreciated 51.48 points to 14,549.50. Sector-wise, the Financial Services Index up 9.90 points to 16,824.16, the Plantation Index was 2.19 points higher at 7,236.03, while the Industrial Products and Services Index decreased 1.12 points to 168.00.